The folks at Canonical are in the process of redesigning the user interface for Ubuntu Netbook Remix. 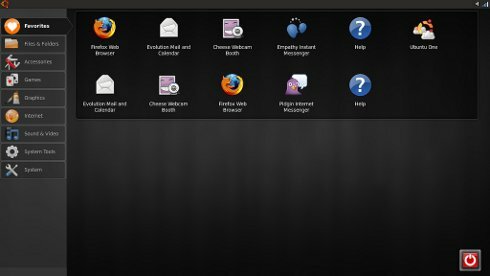 UNR is basically a custom version of Ubuntu that includes optimizations for netbooks with Intel Atom processors as well as a desktop environment and program launcher designed for computers with small, low resolution displays. The first version of Ubuntu Netbook Remix introduced a few key concepts. By default, all program windows opened up in full screen. And instead of a typical desktop and start menu approach, you had a list of application categories on the right side of the screen, program shortcuts with big icons in the middle, and a list of places on the right side. The new version eliminates the toolbars on the right side of the screen to give you more space for program shortcuts. Instead, the places menu has been integrated with the right-side panel. There’s also a slightly refined color scheme, and it’s easier to add program shortcuts to your Favorites area.